The TP-Link Archer C5400 v2 is an excellent router that will appeal to both beginners and enthusiasts alike thanks to an easy-to-use interface that grants access to some highly advanced features. It's well worth the money if you can afford it. The TP-Link Archer C5400 v2 is an upgraded version of the C5400, coming with a new (lower) price, and a number of smart home features that will appeal to people who have a house full of Amazon Echos, Hue lightbulbs and other connected gadgets. Even if you’re not the sort of person who likes barking orders at Alexa, the TP-Link Archer C5400 v2 comes with a build quality and level of performance that we’ve come to expect from TP-Link. So, on paper at least, the TP-Link Archer C5400 v2 is a router that should appeal to enthusiasts, gamers, small businesses and even casual users alike. That’s a pretty diverse audience, so can this router please everyone, or is it a jack-of-all-trades? Read on to find out. The TP-Link Archer C5400 v2 can be bought for around £250 ($299.99, AU$469), which is expensive for a router, although not as pricey as the original TP-Link Archer C5400, which cost £350 (around $490, AU$650) when it was first released. That price puts it in the same bracket at the Billion BiPac 8900AX-2400 and the Synology RT2600ac, two feature-packed routers that are good enough to feature in our best wireless routers list. That price does make the Archer C5400 v2 a harder sell for casual users looking to upgrade the free router they got with their ISP, as there are more affordable routers out there. The Asus RT-AC86U, for example, is a great router that can be had for quite a bit cheaper if you shop around, while with Google Wifi the price difference is even more stark. Google Wifi certainly doesn’t have the advanced features of the Archer C5400 v2, but it’s compact, stylish and affordable, and is also a mesh Wi-Fi system, which means a number of units can be dotted around your house for better Wi-Fi signal. The Archer C5400 v2 is a more traditional affair, comprising just a single unit. 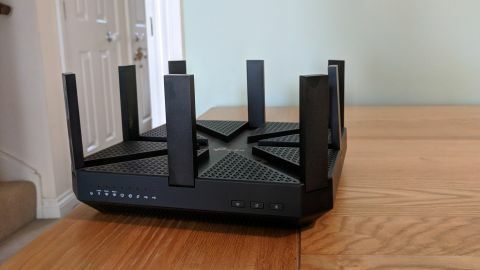 While we’re seeing an increasing number of routers adopt aesthetically interesting designs to better fit in to modern homes, such as the Amplifi HD, the TP-Link Archer C5400 v2 has an unashamedly old-school router look to it. You get a large black box with vents at the top, as well as eight antennae that can be positioned to help improve Wi-Fi coverage. It’s certainly not something that would look good in a minimalist environment, but in a home office, or perched next to a gaming PC, the Archer C5400 v2 won’t look too out of place, and it'll certainly appeal to those who value function over form. At the rear are four gigabit LAN ports for connecting wired devices, as well as a WAN port for connecting the router to a modem. As the Archer C5400 v2 doesn't come with a modem built in it means it can be used with any internet connection, although you will still need to have a separate modem as well. There’s also a USB 2.0 port and a USB 3.0 port for file and printer sharing. So, don’t go expecting a stylish-looking device here, but rather something that's been designed to do the job as well as possible. That’s worth commending as well. It’s not just the design that suggests the TP-Link Archer C5400 v2 means business; the specs list too points to a device that has plenty of power when it comes to handling network traffic. There's a dual-core 1.4GHz Broadcom ARM processor with three co-processors for handling data, with each co-processor handling a band (one 2.4GHz band, and two 5GHz channels). On paper this means that even with busy networks that have a large number of wireless devices connecting to it, the Archer C5400 v2 should keep the flow of data between devices strong and reliable. The eight antennae that protrude from the Archer C5400 v2, making it look like an upturned spider, at least make a good argument for their inclusion, handling the 2.4GHz band with 1000Mb/s of bandwidth over four streams, with the two 5GHz channels also getting four streams between them with potential speeds of up to 2167Mb/s. You may note that this bandwidth is higher than what Ethernet network cables are capable of, potentially causing a bottleneck for wired devices such as Network Attached Storage (NAS) drives and desktop PCs, but TP-Link has addressed this by including link aggregation. This allows you to use two physical Ethernet ports as if they were one connection, so if you have a NAS device or network card that supports link aggregation you can essentially double the bandwidth of the wired connection. This is a feature that’s usually found in network switches and business-orientated routers, so its inclusion in a router that’s also aimed at home users is impressive, and it can make a real difference to your network speeds if you have compatible hardware – especially if you have a NAS device that serves up media and files to various devices in your home, for example. TP-Links' ambition to marry enterprise features with the user-friendliness of devices designed for home use extends to the setup procedure, which is done via a quick and simple wizard. There's also a smartphone app called TP-Link Tether, which enables you to set up and configure the router from your mobile device. While we’re pretty experienced at setting up routers, the clear instructions, along with graphics explaining the steps, makes the process of getting the TP-Link Archer C5400 v2 up and running easy to follow for most people, no matter how much or how little networking expertise they possess, without feeling patronizing. Then there are the Alexa commands, which enable you to turn on features using voice commands and an Amazon Echo device. You need to install the TP-Link Router Skill, and once that's done you can say "Alexa, tell TP-Link I have friends coming" to enable the guest network. Another handy voice command is "Alexa, tell TP-Link I want to connect a new device to the network", which turns on the WPS feature, enabling you to connect a new device without having to enter a password. TP-Link has a full list of Alexa commands on its website. It's a great idea, and with a bit of fiddling (including creating a TP-Link account and connecting it up to the router, then linking the account to the Alexa app) it works well. Most impressively, it gives people an easy and intuitive way to access features without having to delve into confusing admin pages. The IFTTT integration is another nice touch, enabling you to create your own 'recipes' so that you can control the router using simple commands. As far as Wi-Fi performance goes, we were very impressed. Connecting right next to the router we got download speeds of 74.3 Mb/s on the 5GHz band, and 66.8Mb/s on the 2.4GHz. Upload speeds were 18.2Mb/s on the 5GHz and 17.1Mb/s on the 2.4GHz band. This is on a line where the maximum speeds are 76.6Mb/s download and 19.1 Mb/s upload, so you’re not losing out on much speed at all if you go wireless. We then tested the speeds on the second floor of the building, and were pleased to note that even at this distance the speeds of the 5GHz network remained consistent at 74.2Mb/s down, 17.9 up. The 2.4GHz band did drop more significantly, however, with 62.5Mb/s down and 17.1Mb/s up. We also tried the connection on the third floor of the building, and with two floors between our device and the Archer C5400 v2, speeds on the 5GHz band remained very good, with 73.5Mb/s down, and 17.9 Mb/s up. Meanwhile, the 2.4Ghz band offered 60.3Mb/s down and 17.1Mb/s up. These are still pretty good speeds, but you can see the performance gap between the older 2.4GHz band and the 5Ghz band open up here. This excellent performance shows that the Archer C5400 v2 is a brilliant router for people with large houses, and if you have a compatible 802.11ac device you’ll find that you should be able to get fast and reliable Wi-Fi over a large distance. It also means that gamers, or people streaming 4K videos, can use the wireless network without worrying about it impacting performance, instead of having to rely on Ethernet cables. Setting up the TP-Link Archer C5400 v2 is nice and easy. There are plenty of features and plenty of ports, and the Wi-Fi signal is excellent. Alexa integration is a great touch as well. There’s plenty to like about this router. The design won’t be to everyone’s taste, and it’s a bit too large to easily hide away. It’s also quite expensive for a router. The TP-Link Archer C5400 v2 is an excellent router that does a brilliant job of appealing to a wide variety of users. It's easy to set up and configure, thanks to a user -friendly app and interface, yet it also has enough advanced features and powerful hardware to appeal to enthusiasts and enterprise users. The star of the show is its Wi-Fi performance. Forget about faffing with multiple units to set up a mesh system or rely on a Wi-Fi repeater to extend coverage, as the TP-Link Archer C5400 v2 has enough power to cover large buildings with fast and reliable Wi-Fi. There’s no denying that it’s expensive, however, and it’s not the most elegantly-designed router. However, if you have a busy and demanding home network that’s often filled with streaming and gaming traffic from multiple devices, then you’ll see an instant upgrade if you swap out your free router for this one. For many people, that will make it well worth the investment.